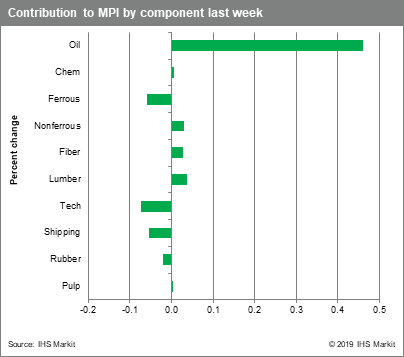 Although currency markets saw some volatility, a series of Brexit votes in the UK Parliament was largely ignored by both equity and commodity markets last week. 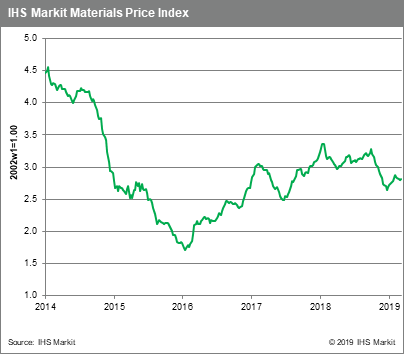 Our Materials Price Index (MPI) reflected this ambivalence, rising 0.4%, its first increase since mid-February, predominantly on oil price strength. Oil prices rallied 2.6% last week as Saudi Arabia announced plans to produce below 10 MMb/d, well under its recent agreed upon cap of 10.31 MMb/d. When combined with news of power blackouts in Venezuela that saw oil production virtually grind to a halt and large inventory draw-downs in the US, supply-side concerns re-emerged, driving oil prices higher. Non-ferrous metals rose, 0.4% w/w, as zinc prices rose on falling LME inventory and copper strengthened on fund buying and reports of disruptions in Chile. Chemical prices have been static in the last two weeks. 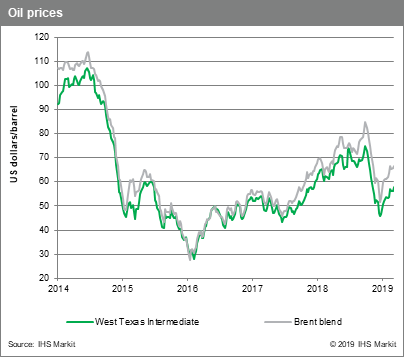 Ethylene and propylene prices have fallen on weak demand, while benzene has rallied, riding recent gains in crude oil prices. 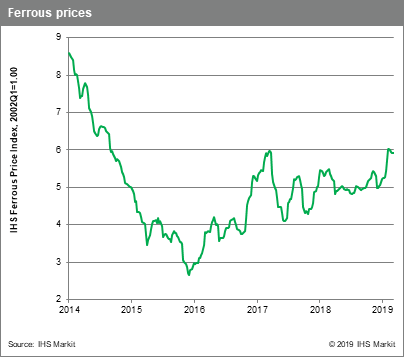 Freight prices fell again last week as a lack of ore shipments from Brazil continue to impact charter rates. Last week, no Capesize vessels left Southern Brazil, which dragged the index lower and further raised iron ore supply concerns. 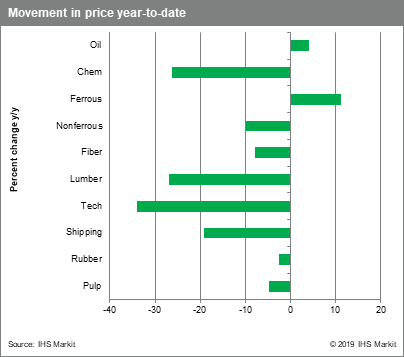 Commodity prices generally remain subdued as commodity markets weigh the economic climate. Brexit is now likely to be delayed as is a proposed Trump-Xi summit that would add clarity to US-China trade. 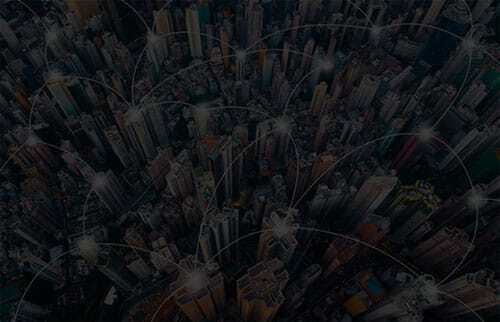 Fundamentals, however, continue to look lackluster, suggesting the lack of direction in prices exhibited for the past month may continue into the second quarter.